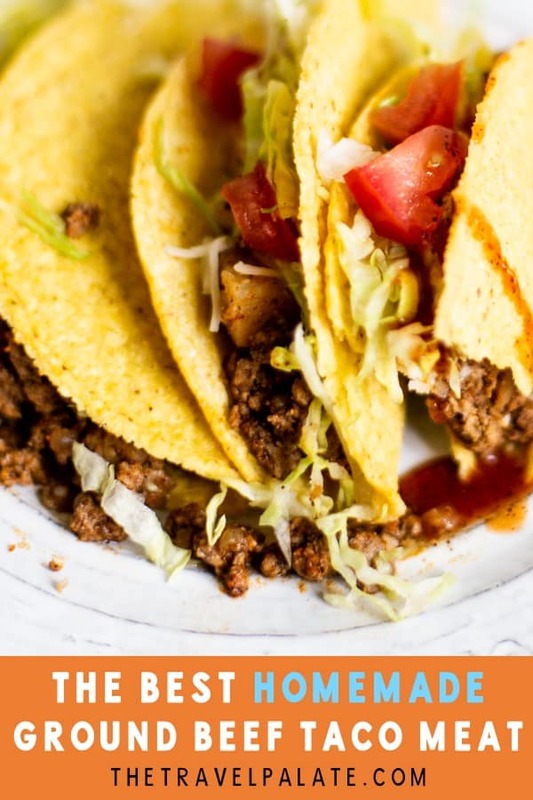 These Ground Beef Tacos are a quick and easy way to throw together a tasty and comforting weeknight dinner! This recipe is packed with the Tex-Mex flavors we all know and love with the addition of papas or potatoes! This is sure to become one of your family’s favorite. What beats tacos? Uh…nothing. 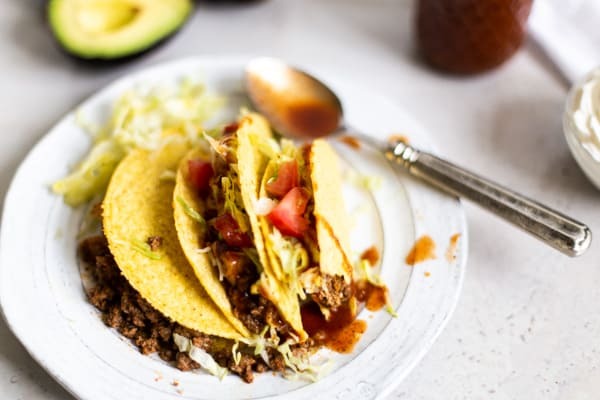 They’re tasty, easy to make, and seasoned taco meat is so versatile you’ll be using leftovers (if there are any) for other yummy dishes like taco salads, burritos, and even omelets! If you’ve never added potatoes to your taco meat then you are in for delicious twist on everyone’s favorite Tuesday dinner. how do i make ground beef tacos? 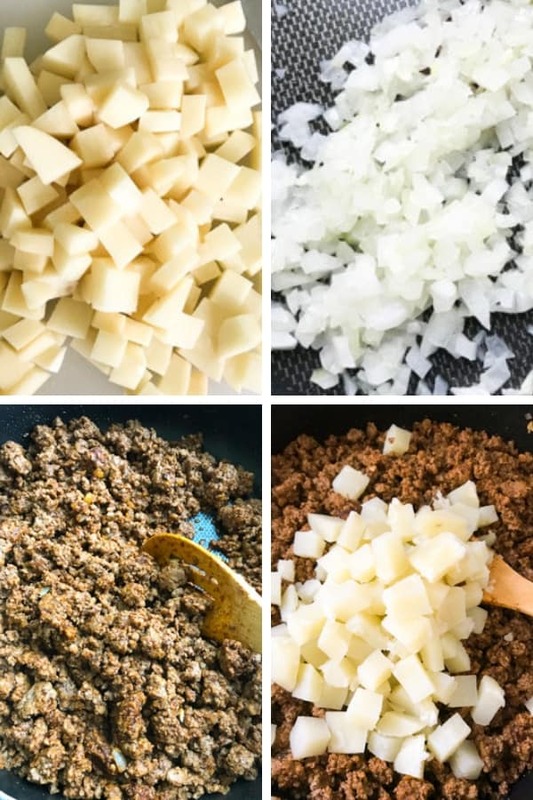 Making Ground Beef Tacos is pretty simple. It was one of the first dishes I learned to cook and continues to be one of my family’s favorite meals. First off, boil your potatoes until they are fork tender. Drain them and set aside. In a pan, soften some onion and garlic in a little oil. If you have picky eaters, just leave the onion out. I did that for a few years because my son had a texture thing and could feel the onion no matter how small I diced them. Add the ground beef to brown and cook through. I usually use ground sirloin, which doesn’t render much fat. I usually leave the juices rather than drain it off. However, if you use a fatty cut, you will want to drain off that fat or you will have an oil slick on your hands, not tacos! Add the Easy Taco Seasoning to the ground beef. Mix it well. Then, add the potatoes and gently mix it all together. Be sure to taste it to see if you need to add more seasoning. When you get just the right amount, let it simmer for a few minutes then you are done! Now just warm up some taco shells or flour tortillas, scoop a spoonful in and enjoy a tasty dinner! See what I mean? So simple! What else can I make with Ground beef taco meat? I love doubling this recipe so there will be plenty of leftovers. One of my favorite things to make is taco salad. You can use up all your left over toppings, even the crunchy taco shells. I just warm them up, crush them in ziplock bag and sprinkle it over the salad. You can also add a can of rinsed pinto or black beans to really stretch the meat and add some fiber! I also love making Beef Burritos. This in another quick weeknight dinner that the kids will love. Did you know Ground Beef Taco meat makes a delicious filling for omelets? When your eggs are just about set, add some warmed-up taco meat and shredded cheese. When the eggs are cooked, top with more cheese, sour cream, tomatoes, and salsa. YUM! 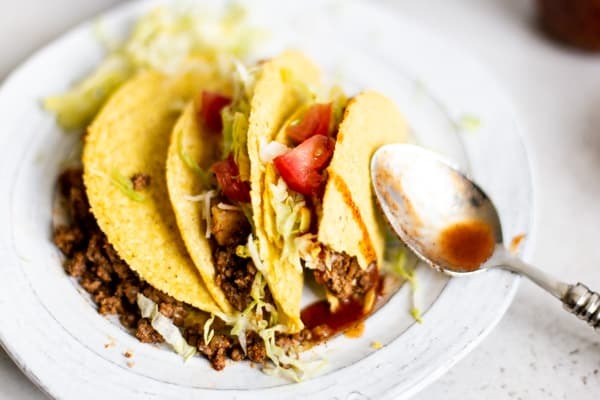 These Ground Beef Tacos are a quick and easy way to throw together a tasty and comforting weeknight dinner! This recipe is packed with the Tex-Mex flavors we all know and love with the addition of papas, or potatoes. This is sure to become one of your family’s favorite. 2–3 tablespoons Easy Taco Seasoning or one packet store bought taco seasoning prepared according to package directions. Peel and dice potato into half inch cubes. Add the potatoes to a medium saucepan and fill with cold water until covered. Bring to boil over medium-high heat. Add teaspoon salt. Cook until potatoes are tender, about 8-10 minutes. Potatoes are done when they can be easily pierced with a fork. Drain and set aside. This step can be done a day ahead. Heat oil in a large skillet over medium heat. Add chopped onion and saute until softened, about 8 minutes. Add minced garlic, saute for 2 minutes. Add ground beef to skillet and brown meat until cooked through. If you used a lean ground beef, you may not have much fat to drain off. If you used a fatty ground beef, will want to drain off some of the fat. (Unless you love greasy tacos!). To drain off the fat, tilt the pan slightly and use a spoon fat off into a jar or can. Don’t pour the fat into your sink drain. That’s bad for the pipes! Sprinkle on 2-3 tablespoons Easy Taco Seasoning. Mix well, being sure to get the seasoning on all the meat. Add the cooked potatoes and mix-in gently. Taste the meat mixture and add more seasoning if needed. Simmer on low for about 5 minutes. While the taco meat is simmering, warm your taco shells or tortillas according to package directions. Add your favorite toppings and enjoy! Nutritional information provided is an estimate and doesn’t include toppings. If you made Ground Beef Tacos, or any other recipe on the blog, don’t forget to leave a rating and a comment below. I love hearing from my readers! You can also find me on Facebook, Instagram and Pinterest! 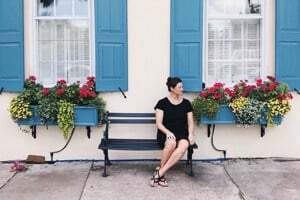 Nikole is the creator and photographer behind The Travel Palate, a food and travel blog featuring quick and flavorful recipes and getaway guides. Nikole hopes to inspire your inner foodie whether you're in the kitchen or traveling on your next adventure. Thank you Linda for adding a useful tip! I hope folks find it helpful!! Isn’t taco night the best?! Perfect for #tacotuesday! Love the addition of potato to your taco meat! Thanks Courtney! It makes it so yummmy! I love how your tacos sound easy to make and so flavorful, I really want to try making them, thanks for sharing! Thanks for checking them out Patty! I love the idea of the potato in the meat mixture! I grate potato for my meat mixture for taquitos, but have never used them for tacos! It makes tacos even more budget friendly! Sometimes simple recipes really are the best! I love how this is such a great dinner for a busy night. Perfect for the family. This is my favorite go-to weeknight dinner recipe! I love tacos too although we don’t have them as often as I would like! Your tacos look absolutely delicious and I like the idea of making my own taco spice! Sometime I think I eat them too often! WANT POSTS DELIVERED RIGHT TO YOUR INBOX? CLICK HERE TO SUBSCRIBE! don’t miss these great recipes!